There has been an increase in awareness on the benefits of fasting lately. The practice of fasting in itself is, of course, centuries old. Many religions and traditional practitioners have included fasting as a spiritual exercise or healing protocol, but until recently we didn’t fully understand the science behind the health benefits. The truth is we, as humans, are incredibly adaptive to periods of starvation. Our ancestors often went through periods of fasting (often not by choice), and so we developed an ability to efficiently utilize our fat stores once food has run out. The luxury we have now of the constant availability of any food product we could want is something that has never happened before in our history. 1. Fed (anabolic): This is when our body is digesting or absorbing food. Usually this lasts 3-5 hours after eating. In this state, blood glucose and therefore insulin levels are high. The body operates on the readily available sugars circulating. 2. Fasted (catabolic): The post-absorptive phase occurs 8-12 hours after eating; therefore most people rarely even enter this state. Blood glucose levels and therefore insulin lowers, so the body starts reaching for its alternate source of energy: fat. A growing body of evidence links fasting and caloric restriction to longevity, decreased cancer, heart disease, diabetes and cognitive decline, better recovery from exercise, increased fat loss, and more energy. It also has the benefit of making your life simpler, since you’ll spend less time on food preparation and eating. How do you practice Intermittent Fasting? 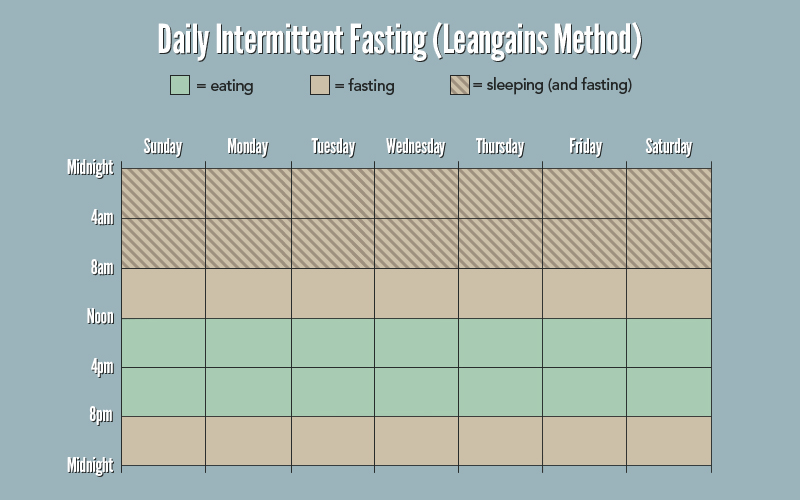 There are a few different options when it comes to fasting: Daily, alternate days, or weekly. 1. Daily: All food consumption is limited to a period of about 8 hours. Most people go about this by skipping breakfast (yes, the contrary to popular belief this CAN be a healthy practice!). A good option for weight loss. 2. Alternate Days: Fasting is done for longer periods of time, but only a couple days per week. Also a good option for weight loss. 3. Weekly Fasting: A 24-hour fast is done once per week. This option is best if your goal is to maintain weight but still get the benefits of fasting. Choose which option suits your lifestyle best. If you have more questions regarding fasting, feel free to email me via the CONTACT page.